Two of us were fortunate enough to take a helicopter flight with this wonderful team on Sunday afternoon. From the time we arrived to the time we departed we were impressed with the great natures, friendliness and professionalism of all staff we encountered. While we were unlucky with weather (rain/low visibility closing in) but managed to get out on an alternative path which we were very grateful to John (our helicopter pilot) for accommodating. Thanks to all involved and a special thank you to John for tolerating our bad jokes and also for his terrific commentary. Highly recommended - if you are considering a chopper flight in Hobart you simply won't beat this team on price or service. I have done a number of flights in a variety of countries and this stacked up with the best of them. A fabulous experience with a friendly, knowledgeable pilot who didnt hesitate to explain points of interest. This interaction was most appreciated.Prior to the flight there was fantastic communication when a flight change was required due to service scheduling. The helicopter was spotless. Because only two passengers were assigned to the flight, both had unrestricted views and impressively, the passengers could nominate places they would prefer to see. Wonderful chopper ride over the outlying areas of Southern Tasmania! Everything went as planned from pick up to ride to delivery back to our hotel. Our pilot was friendly and informative. Decided to do this trip a couple of days before but unfortunately they didnt get back to us or change flight booking from pending to confirm - so on the morning of the flight we had to start ringing the USA base from Tasmania to confirm where flight went from and what time. This obviously meant we incurred extra costs for calls etc. 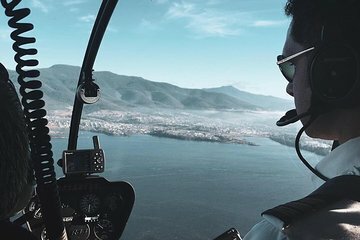 Having said that once we got to the designated place the flight itself was an amazing way to see Hobart and a great experience all round. Got to take some amazing pictures and all three of us agreed it was a great trip to do.